These caramelized candied carrots with brown sugar and butter taste just like candy and are a great tasty side dish to any dinner. *This post was originally published 7/10/2012. Pictures, recipe and some content have been updated. I’m re-sharing because this is a great recipe for spring and especially the Easter holiday coming up soon. Enjoy! Here comes Peter Cottontail…Hopping down the bunny trail…Hippity hoppin’ Easter’s on its way…. 36 hours. That’s how long that song was stuck in my head after making these candied carrots. Even as a pretty impatient person, I don’t usually consider a day and a half a long period of time. That is until I had those 3 lines stuck in my head. If I wasn’t singing it, I was whistling it. If I wasn’t whistling it, I was humming it. Oh vey. I went from thinking these tender spring carrots with their fun green stems were the cutest thing to ever reside in my produce drawer to wishing they’d never appeared in our CSA box after about hour 3 of that song being stuck in my head. Well, except for the 5 minutes that I inhaled the finished candied carrot recipe as my sole food item for lunch as I plucked them one by one off the serving platter with my fingers. I’m not a candy person. Chocolate? Yes. But not candy. These carrots however, tasted like the best damn candy I’ve ever eaten. AND THEY WERE A VEGETABLE. A little brown sugar and butter will do that I guess. I’m not sure 36 hours of children’s rhymes in my head were worth it but it was pretty darn close call. Candying a vegetable is quite simple, there’s usually just two ingredients: butter and sugar. These candied carrots are no exception. 1 tablespoon of butter and 2 tablespoons of brown sugar are heated in a skillet and the carrots are added, tossed around to fully coat all sides and cooked over medium heat until a lovely deep caramelization starts to occur. You’ll know the carrots are ready when they’re fork tender, starting to wrinkle a bit and have achieved a lovely sticky glaze to them. What’s The Difference Between Glazed Carrots And Candied Carrots? That sticky glaze is what signifies the carrots are “candied”. You could call these brown sugar carrots or brown sugar glazed carrots but I think there’s a slight difference between a glaze and something being “candied”. A glaze has more of a sauciness to the exterior of something while when something is candied it achieves a coating that almost hardens to a candy-like texture. Don’t get me wrong, the outside of these carrots is no jolly rancher or anything but there’s a definite “candy-like” coating versus a saucy glaze. Can I Use Regular Or Baby Carrots? 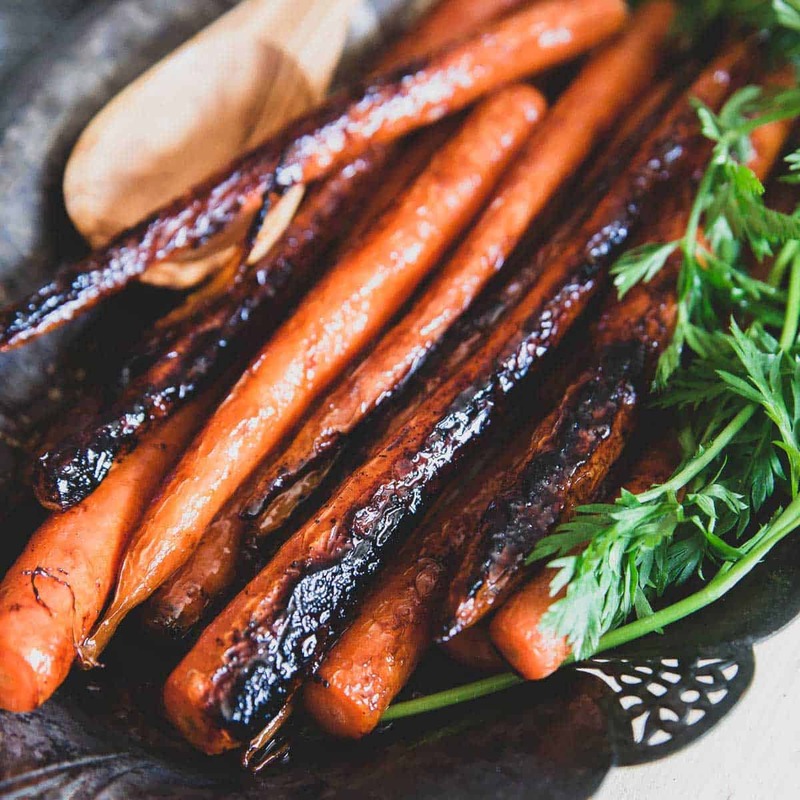 This easy candied carrot recipe will work with any type of carrot. If you’re using store bought baby carrots (those little nubby guys) just lower the cooking time by a few minutes. 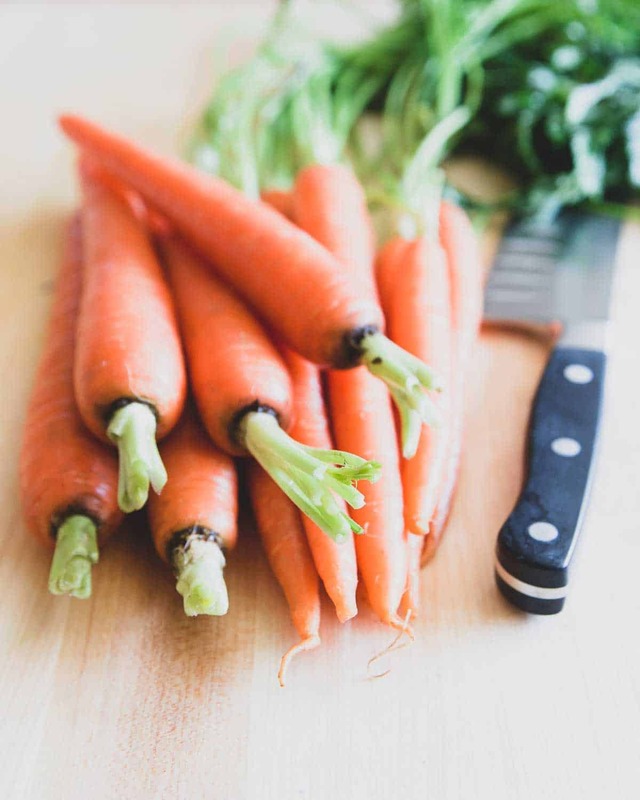 If you want to use regular carrots which are usually a bit thicker in diameter than fresh carrots with the greens still attached, I would suggest slicing them lengthwise at least in half. Otherwise, you’ll end up with a candied exterior but the carrots likely won’t cook fully through and be hard in the center. Do I Have To Cook Or Steam The Carrots First? The short answer is no. 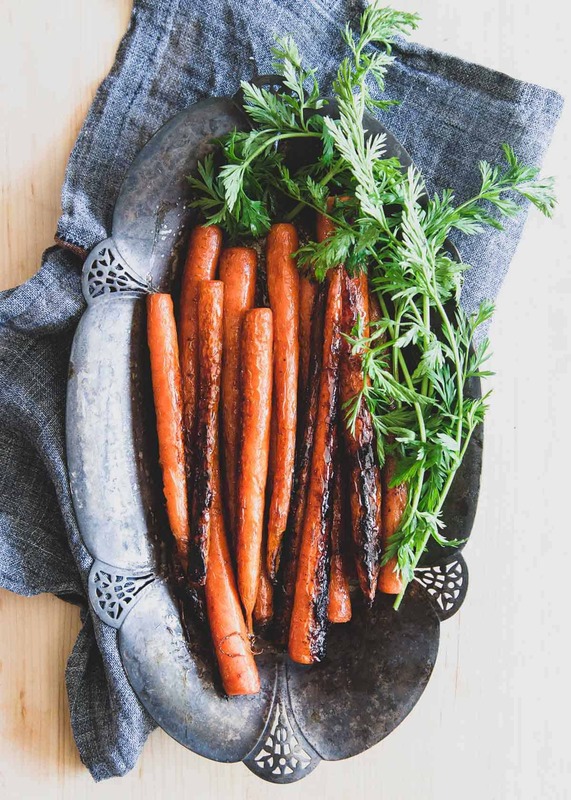 If your carrots are the right size (these are about 1/4-1/3″ thick in diameter) they will fully cook through in the time it takes to achieve that candied exterior. I see no need to steam or pre-cook the carrots before candying them, that’s why I love this stove-top recipe so much, it’s really the easiest way to make candied carrots! The one trick is finding a nice medium heat on the stove. Each stove burner is different and you know your own better than anyone so use your best judgment (for example – my “medium” heat is about a 3/4 out of 10 level because my stove runs hot). You want a temperature that won’t burn the butter and sugar but will also cook the carrots through and develop the nice candied coating. 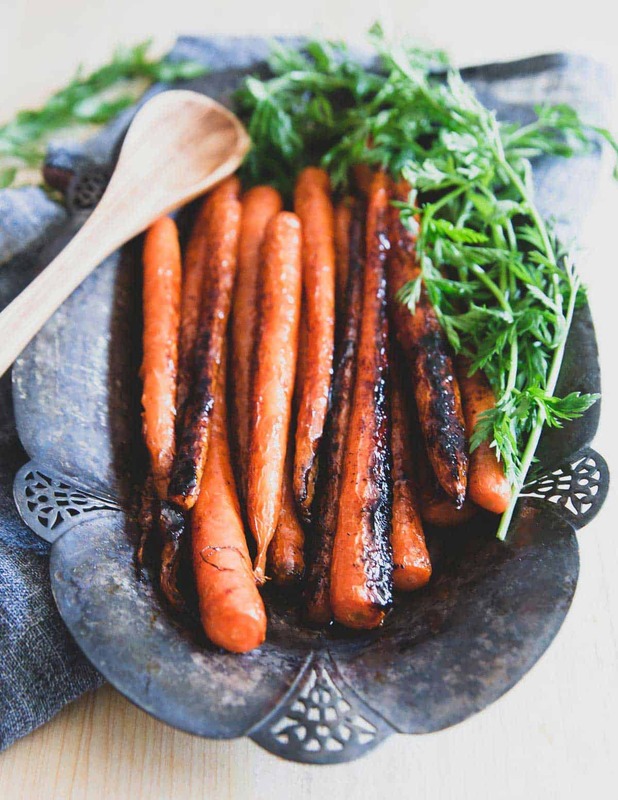 These brown sugar candied carrots make a great side dish to many meals. The fact that they’re made stove-top in just one pan and in about 15 minutes start to finish make them a great choice for a quick dinner or even a holiday meal. If you’re making these for Easter, you could try them with these citrus braised lamb shanks or these skillet lamb chops. They’d also be great with this sun-dried tomato pesto stuffed flank steak or with an apple butter roasted chicken. These caramelized candied baby carrots with brown sugar and butter taste just like candy and are a great tasty side dish to any dinner. Separate carrots from green stems and wash well. In a skillet over medium heat add the butter and brown sugar, stirring until melted. Once melted, place the carrots in a single layer in the pan and gently toss to coat with the butter and sugar mixture. Cook carrots, shaking the pan to turn them every minute or so for about 7-10 minutes until each side is golden brown and starting to caramelize. Season with salt & pepper and transfer to a serving platter using stems to garnish. *You can also cook and eat the stems. Simply sauté with some butter until wilted and season with salt and pepper. This is how my husband’s mother/grandma make carrots and they’re insanely good! I’m so jealous of your fresh carrots right now! I love these little guys – they’re ten times sweeter and more crisp than the carrots you get at the grocery store…oh how awesome CSA boxes are. I’ve never tried the candying method and it looks delicious! 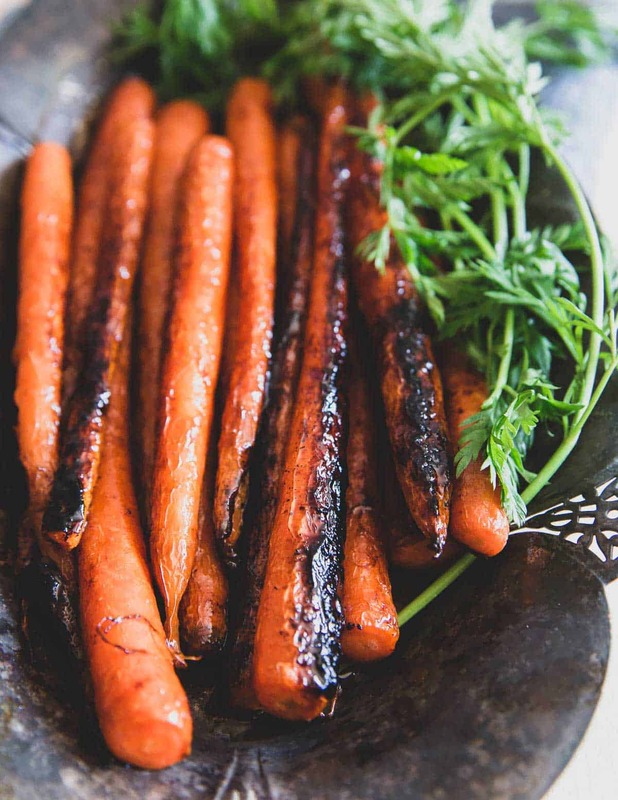 I normally just roast my carrots in some olive oil but this sounds like the best way ever to eat them with that hint of sweetness and all that flavour. Gina, with 3 huge bags of baby carrots in my fridge, you nearly read my mind posting this recipe today! I need some creative ways to use them up! When I picked up carrots like that at my farmer’s market last year I ate them all as is just plain…this would’ve been way better. Holy moly! These look SO good! And thanks for the song – I’m about to go for a run and I’m sure that’s what I’ll be movin’ my feet to now! Love this Gina! I have eaten my carrots already but the greens are still sitting in my refrigerator, waiting to be eaten. I have been thinking of ways to eat them but it never occured to me that simply sauteing them with butter, salt, and pepper is the way to go. Yeah, I contemplated for far too long about what to do with the greens and then I tasted a bite raw and realized they were so young and tender that a simple saute would work just fine :) You could probably doctor them up more, but why complicate things, you know? I was wondering what you were going to do with those carrots when I saw you post them on Instagram :) Yum! Amazing photos for this recipe! haha, wo those sound awesome. I munch on raw whole carrots all the time and this is making me realize how darn boring that is when I could have buttery sweet carrots. I love how you left the greens on too. These carrots look perfect! Definitely Peter Cottontail approved! I feel like I tell you this every time, but seriously, your photography is stunning, Gina! I’m just learning to love carrots (aside from carrot cake, which I have no problem consuming! ), and I think this recipe will definitely be making its way into my kitchen. all of your photos rock. But these? Belong in a cookbook. On the cover of Bon Appetit or something. Absolutely stunning. I normally detest cooked carrots but could prob get down with these. Not a fan of candy either. Chocolate yes, candy not so much. Those carrots look killer! Scrumptious. And lovely shots too. I’m glad I’m not crazy for immediately thinking of bunnies when I saw this lol. Never eaten carrot tops, but I’m totally gonna try them! I can’t get enough greens. This is a great way to get the kids eating veggies. Mine just love the added sweetness brown sugar brings. This is my new favorite side dish! They’re so easy to make but SO delicious!